The South African anti-apartheid movement is often mischaracterized in the United States as simply a fight for political rights, culminating in the election of Nelson Mandela as the country’s first freely chosen president. However, a crucial component of the broader anti-apartheid struggle was the black union movement. Black unions linked their political objectives for an end to racial oppression to their campaigns for higher wages and better working conditions, and aimed to democratize power relations in the workplace. This lesson invites students to imagine themselves as black union activists at the height of the anti-apartheid movement in the 1980s and poses them problems that confronted real-life organizers at the time. Note that throughout the description of the activity, a number of racial designations are used. 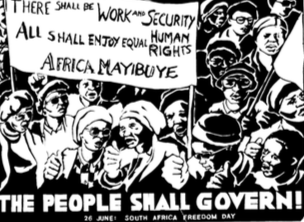 About 10 percent of South Africans, people the government decided were of mixed race, were classified “Colored.” Almost 75 percent of South Africans were classified as “African.” The government then divided them further into tribal groups such as Xhosa, Zulu, and Venda—an effort seen as divide-and-conquer by the anti-apartheid movement. Even though South Africans of European ancestry spoke two languages, Afrikaans and English, and had important cultural differences, the government counted them as one unified group: white.